SOLD 21 x 14 x 1.5 inches overall. Encaustic wax & mixed media on board. 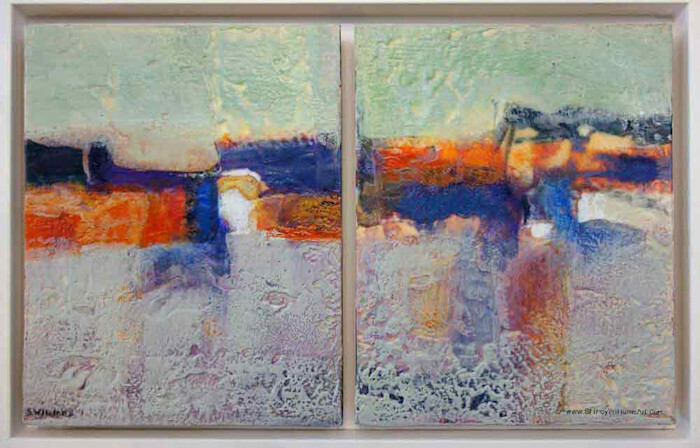 2 panel diptych float-mounted in white frame. Ready to hang. This original encaustic painting is part of my Horizons series. It's a theme that I continue to revisit as my memories often return to growing up as a military kid. During long drives in the car, I'd be in a trance observing the horizon slide by. My approach is to juxtapose shapes and textures that simply evoke associations with the horizon.